I thought I would give a little update on how I am progressing with the challenge, A Year in Books. As I was displaying some of the books I’ve read for a snap-shot Artie came over to give me his approval. It was a slow beginning to the challenge. All I read in January was two books. Since then I have managed to read more frequently, even taking the Kindle with me on the bus to work. Reading while travelling usually tires me, which is why I have only just started up again. This novella featured as part of a short Open University course I took last year. David kindly bought it for me for Christmas. The theme is of grief and survival. After a sudden death of a wife and mother, two son’s and a father are visited by a crow (personified from the Ted Hughes book of poems Crow.) The narrative is quite fractured and erratic. The story just features short scenes of the family in states of ‘coping/or not coping’. Crow is depicted as a wild, untamed creature with bad manners and equally bad language. I think I need to read the story again as a lot of the message was lost on me. David Jones was a survivor of the First World War. I came across his work featured in a documentary on the writers of WW1. In it’s time, In Parenthesis was hailed as a classic, but now sadly seems to have been forgotten. I managed to get a cheapish copy on eBay. The writing can be difficult to understand at times as Jones dips into Welsh and Arthurian legend. The narrative is his own experiences in the British Expeditionary Force and of one attack during the Battle of the Somme, at Mametz Wood. Some of Jones’s writing of trench warfare can only be described as lyrical, even his depictions of disemboweled men and decapitated heads smiling back from the crook of trees like Cheshire Cats is somehow horrifyingly captivating. I would recommend this book to anyone interested in history. Yet another book on grief, though totally different in it’s approach to Max Porter’s book. I think this has been one of my favourite reads so far. I thoroughly enjoyed Macdonald’s description of Mable and how her relationship with this wild bird became cathartic to her wound gaping grief at the loss of her father. The chapters featuring her inspiration, T.H.White made me feel a little uneasy in his behaviour to his Goshawk, though he was writing from a different time period, still doesn’t make the reading any the easier. One of Thomas’s last works, commissioned for BBC radio. This play for voices is a day in the life of a small Welsh village. An omniscient narrator introduces each character and a second narrator tells more about their hidden thoughts and desires. Each character has their own vignette, though written in prose the language is poetic, sometimes lewd, often humorous and occasionally poignant. I found though that my reading lacked the power of a TV or radio production. Perhaps I would benefit from a second read? I reviewed this book in my Sunday Sevens #24. All I know of Alan Titchmarsh is from his gardening programmes and his Saturday show on Classic FM. When I saw one of his books, The Haunting on the shelf in WHSmith I was curious. The story is a dual narrative, historical drama set in 1816 and 2010 respectively with a hint of ghosts and a splash of romance. The book is an easy read but the narrative won’t tax the mind. The story is a little contrived and could have been better but it is what it is. I enjoyed it enough to buy another of his novels. Folly. If I had known this was only 30 pages long I wouldn’t have bought it, however the writing was good and I enjoyed it. The characters were from a previous novel by Riordan, The Girl in the Photograph. Though reading the novella I couldn’t remember the original novel. I had to read the blurb to get any recall. Set in the 1930’s the story is of Marjorie who finds out her husband is having an affair. During the too few pages Marjorie awakens and becomes self aware. The novella ends with Marjorie riding on her bike with her future stretched out with many possibilities. If I like a book by an author I usually seek out other works by them, this was the case with Birdcage Walk, Riordan’s first published work, and you can tell it is! It’s very different in style to that of her later works, The Girl in the Photograph and The Shadow Hour. The story is based on a true tale of murder, mystery and a possible miscarriage of justice. Sadly, Riordan spends too long setting up the back story. Both protagonists are rather quarrelsome and two dimensional, and I didn’t bond with either of them. The narrative only improved after the subsequent murder and trial. There wasn’t much evidence of a miscarriage of justice, but that’s up to the reader to decide. The inevitable wasn’t much of a surprise when it finally arrived. David has chosen the next book for me to read. Emma Healey’s Elizabeth is Missing, I have no expectations on what to expect within it’s pages. 2016 Classic FM Hall of Fame. It’s 20 years since Classic FM started their yearly poll on the nations favourite classical music. My choice for number three: goes to Antonín Dvořák Symphony No 9 (From the New World). I chose the scherzo as an example of the vibrancy of the piece. Though I do love Leonard Bernstein’s 1962 version with the New York Philharmonic. Over the past year I have enjoyed listening to the 9th symphony, when it plays on the radio. It makes me want to know more about Dvořák, of his life and his works. My choice for number two: has got to be Sir Edward Elgar’s Nimrod from his Enigma Variations. It has always been a piece of music that stops me in my tracks. Whether it be cleaning, cooking or changing the bed sheets, I always have to stop and think, to reflect as the music drifts around me. I chose this piece last year and it reached number three in the chart, so who knows. Maybe we can get Elgar and his Nimrod to number one?? And for my number one, this year: I have picked a Rachaminov, but not his piano concerto number two, (which is divine) and had my vote for previous years! I have decided to go against the grain and vote for his symphony number two! It is only one of a few symphonies that I can listen to in its entirety. The others being Mahler’s 5th, Beethoven’s 5th (you can see a pattern there? – must be something about the 5th symphony! ), Sibelius’s 2nd symphony and Dvořák ‘s 9th symphony! In previous years I have been glued to the radio, listening with bated breath as to which composer achieves the accolade as being the nations favourite. In 2016 I shall worry less about whether Rachmaninov or Vaughn Williams gets to the top spot. I will just be enjoying the countdown over the Easter weekend. Will you be voting in this years poll? Who will get your vote? I’ve been meaning to do a photo an hour blog for some time, ever since I saw sunshine and celandines post in July. So, I decided to do it for today, 22nd August 2015, though in hindsight I should have chosen a day where I actually did something instead of the usual, same old! Anyway, I shall endeavour to make some kind of blog out of the pictures I took! 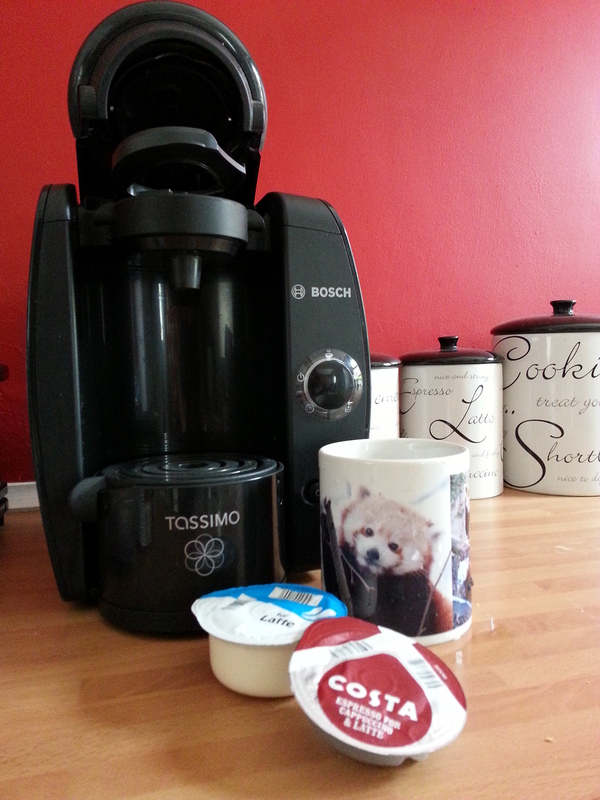 It was an 8am start to the day, as shopping and housework beckoned. 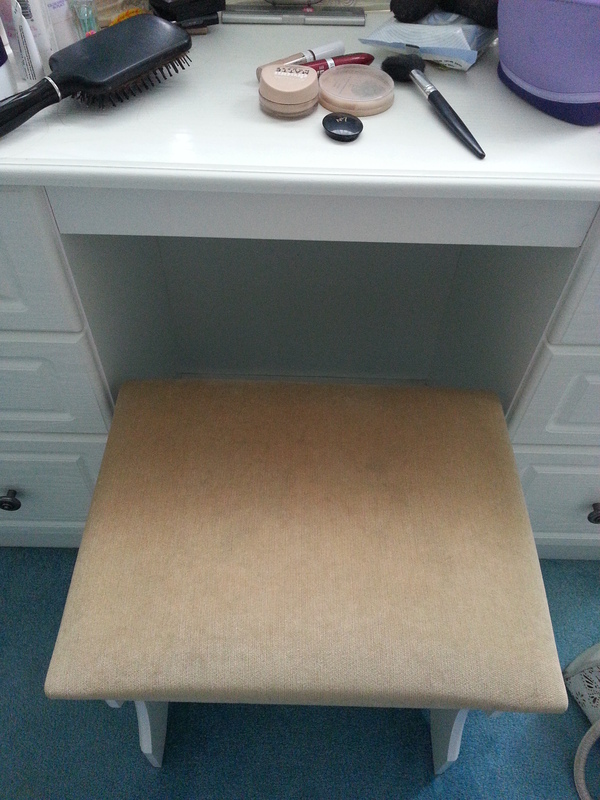 This is the stool where I sit and try to make myself pretty each day! 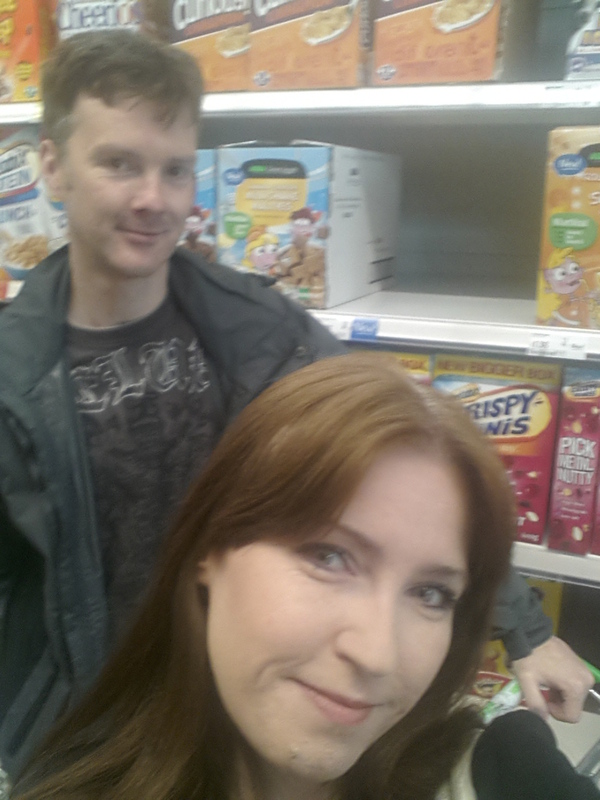 From 9.00am to 11am David, myself and my mum went shopping at the nearby supermarket. 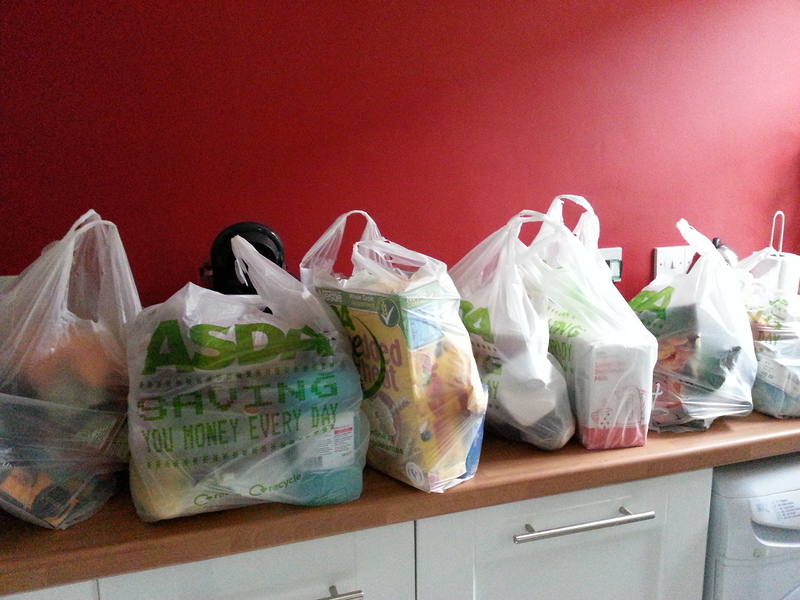 Around 11am we returned home and unpacked the bags of shopping! Thankfully this week’s shop did not total over £100+ as the past weeks have been!! Weekend lunch is so much more relaxed and longer than work days! The next hour was taken up with drinking coffee! Then the hard work had to begin. I vacuumed the floors and cleaned/disinfected the kitchen/bathroom and bedroom! 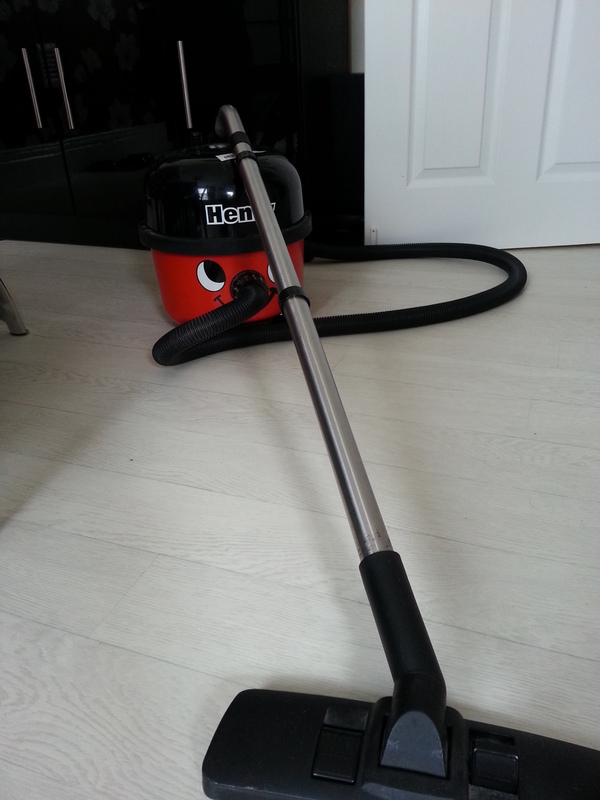 Poor Henry always shivers in fear when he sees me reaching for him as his nose always falls off when I vacuum!! 3pm and after a showery morning, a break in the clouds gave me and Artie the opportunity to step outside into the garden and enjoy some sun, air and listen to the numerous Honey Bees visiting! 15.00 to 16.00, can you spy Artie? From 4pm I made a start on preparing for the evening’s meal. 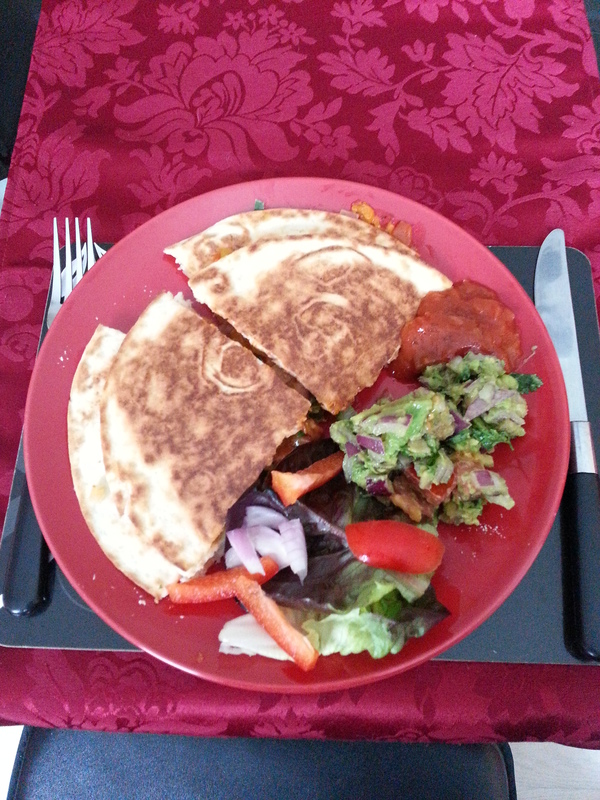 During the week I had decided on making Refried Bean Quesadillas with home-made Guacamole. I turned my attention to the Guacamole first having never made it before. I followed the instructions to the letter. The result was a fresh ‘salad’ like concoction, though David did not like the taste. I found the ingredients only stretched for three people! Heat the oil in a large frying pan (I just used a pan), and cook the onion and garlic for 2 mins. Add the chilli and pepper, and cook for 2 mins. Then finally add the cumin and cook for 1 min more. 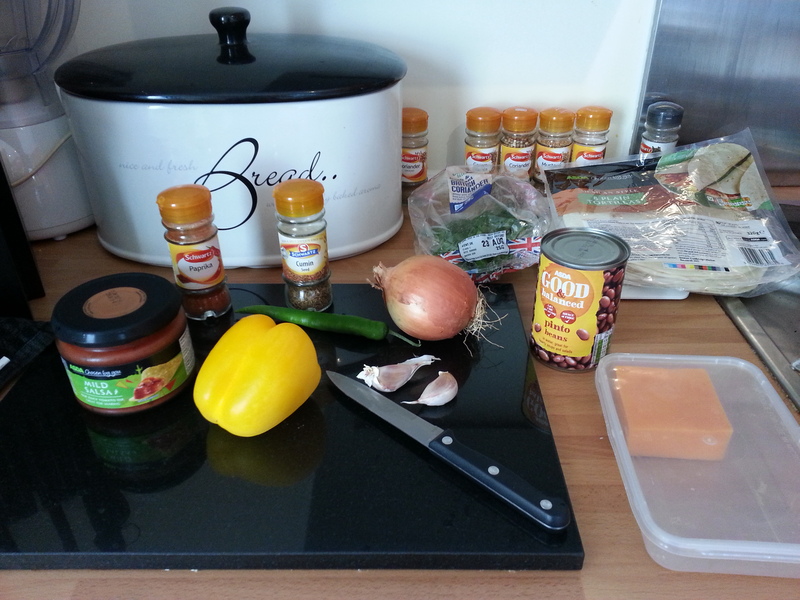 Spread the refried beans onto 3-4 of the tortillas and scatter over the cheese and coriander. Spoon over the salsa, then top with the remaining tortillas to make 3-4 sandwiches. Wipe the frying pan with kitchen paper (or use a frying pan), and return to the heat or heat a griddle pan. Cook each sandwich for 1-2 mins on each side until the tortillas are crisp and golden and the cheese is melting. Serve warm, cut into wedges, with extra salsa, guacamole and salad. 18.00 to 19.00 The result! I enjoyed making the guacamole and refried beans. I could have bought shop brands but thought it would be better to try and make them from scratch myself. The dinner was indeed fresh tasting and filling. For the last hour for the blog. I looked forward to a BBC Prom, of Mahler’s 6th Symphony. 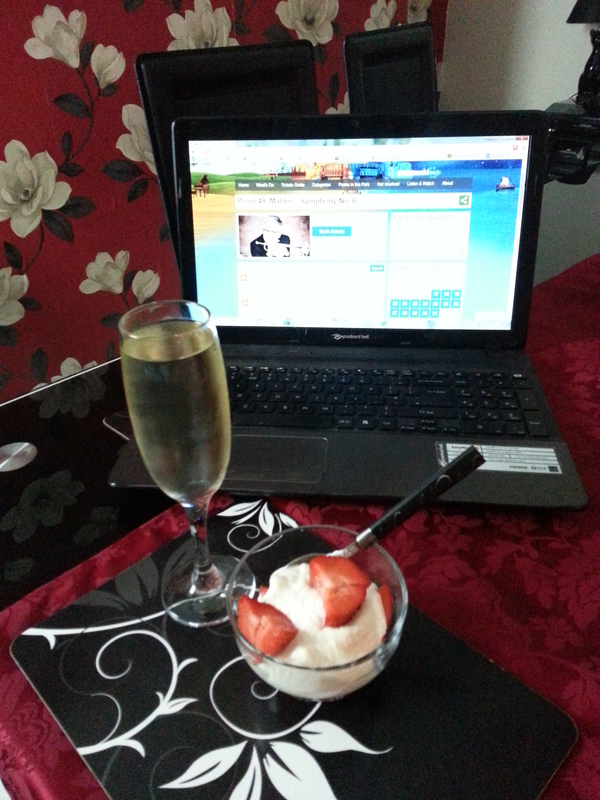 I relaxed for the evening listening to sublime music and enjoyed a few Pinot Grigio’s and a dessert of sliced strawberries with yoghurt! It’s the last day of 30 Days Wild organised by The Wildlife Trust. I cannot believe that a month has passed so quickly! In the past 30 days I have tried to be more vigilant to the nature that is all around! 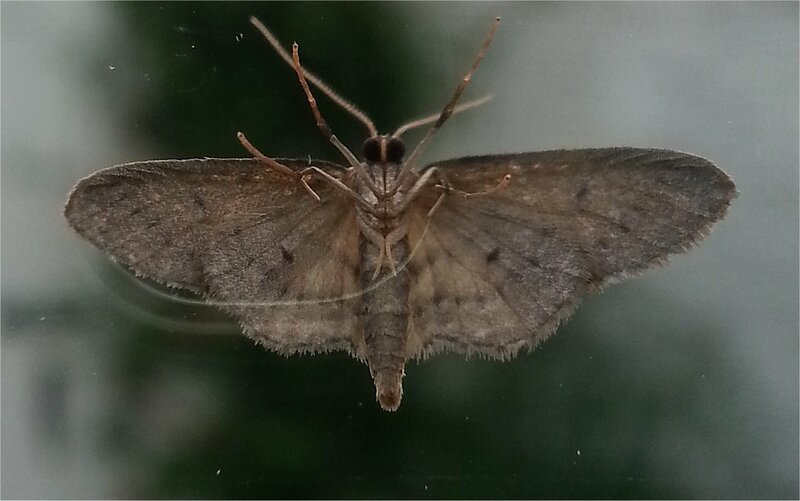 I also took a snap of this moth resting on our dining room window, though I couldn’t identify it. Phew! What a scorcher of a day! The hottest day of the year so far and tomorrow promises to be equally as hot though with some thunder storms thrown in to keep us on our toes! 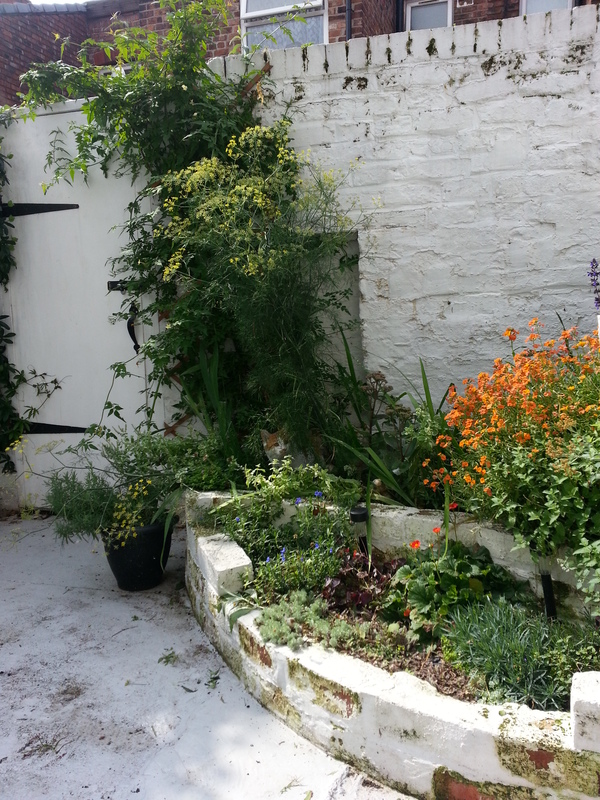 I rushed home from work to enjoy the outside space that is my little urban garden. I watched the visiting House Sparrows as they sat on TV aerials. There were not as many bees visiting the Cat Mint. I think its flowers are starting to die, so I need to set pruning it so it grows a second time this summer. While slowly turning pink I noticed the quiet fluttering of a butterfly as it made its way from garden to garden. 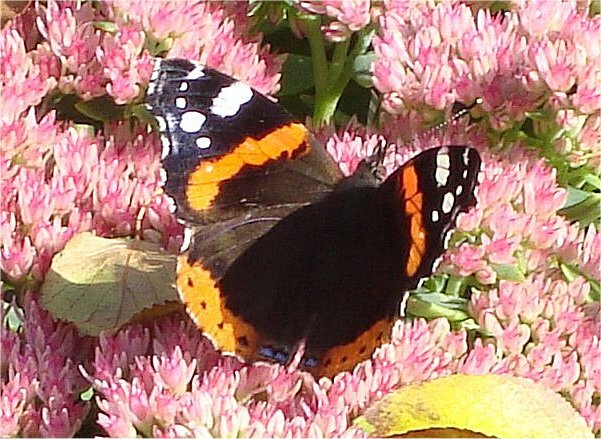 It was a Red Admiral, though it did not stop long enough for me to take a picture, so one from a couple of years ago will have to do! Yesterday, my mum and I replanted some of the Borage seedlings that had grown madly since planting them the first week of June. However today I noticed that most hadn’t taken to their new pots and looked sadly limp. Oh well I still have lots so hopefully some will flower? Only time will tell! I now sit writing this post in the garden. The humidity still lingers as the sun begins to set behind the row of houses to my right. A chilled glass of wine is close to hand while Classic FM is on in the background. Artie tries, (but thankfully fails) to stalk Cinnabar Moths while the Cat Mint is now a buzz with bees. I thought I would utilise the warmth of the ‘heatwave’ and enjoy the last few hours of my 30 days wild! 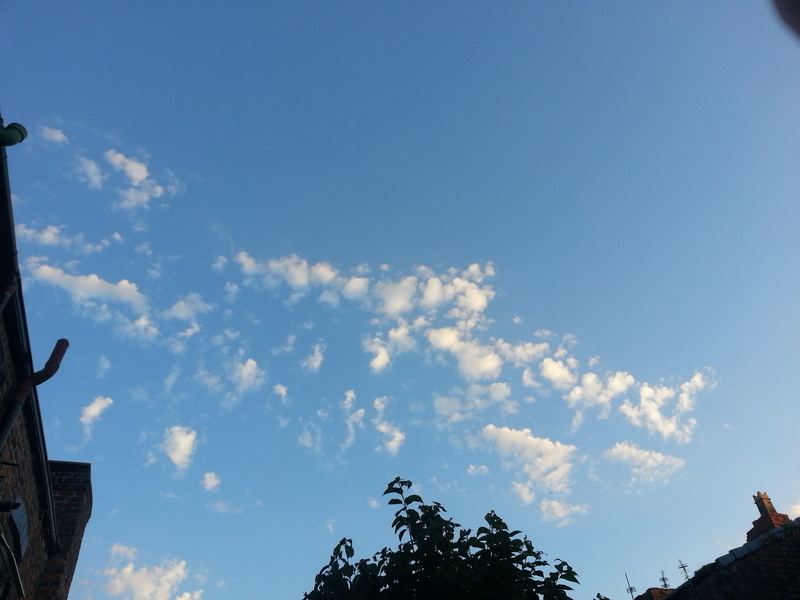 Sitting here quietly I have already seen five squeaking Swallows as they soared high into the blue sky. I think their young have fledged. I only hope that I manage to get some footage of them before they head back on their long journey south. The evening air is filled with the chattering sound of Goldfinches as they come for their late evening snack before roost and now I have the cackling presence of a Magpie. One is never alone with nature, and living in a city, it is rarely quietly still. 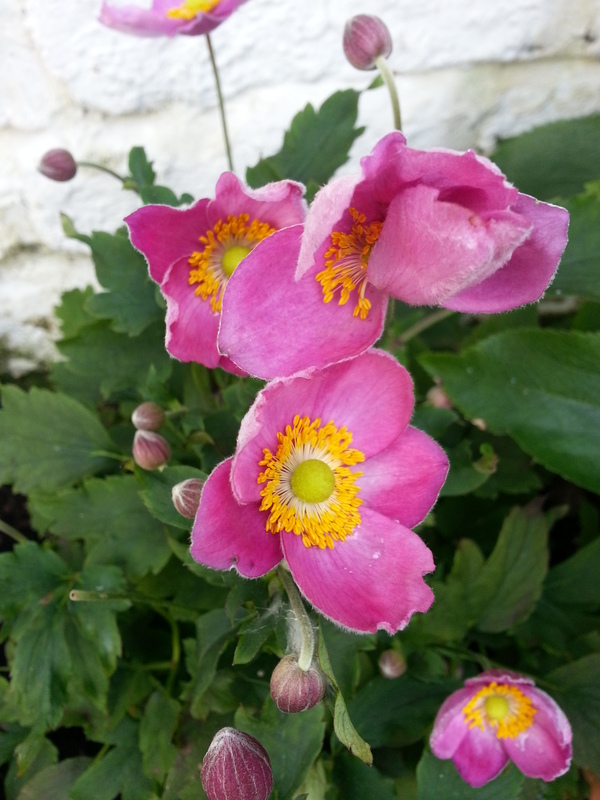 The voices of people’s lives going on around me punctuates the nature that I welcome into my garden. 30 days wild has been a challenge in a way for me as I have tried to look beyond the nature that visits my garden. I am still useless when it comes to Bee identification and thank the Facebook page: UK Bees, wasps and Ants for helping ID most of the bees that have frequented my garden. I would have liked to have seen more butterflies and moths but I am happy with the number of birds that have visited the feeders. It may only be small but I do my little bit for the nature in my area. 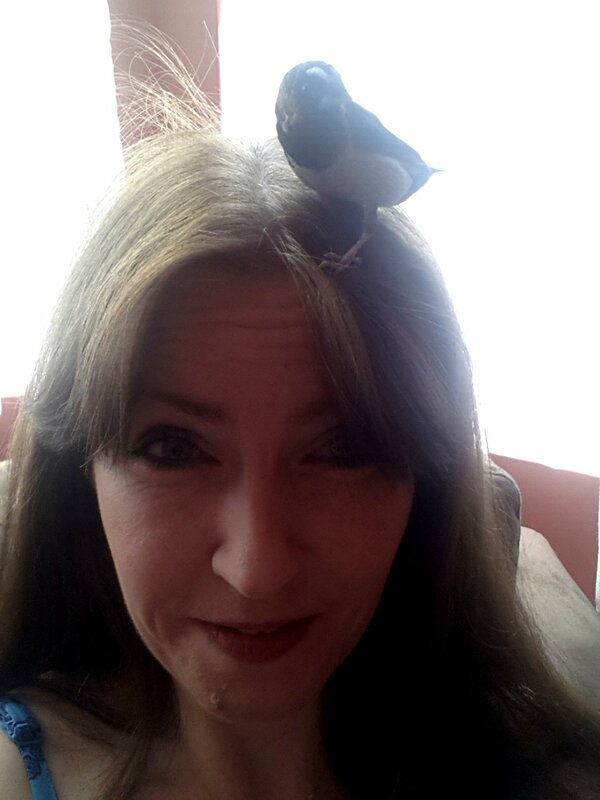 If that is to plant a bee friendly plant or more feeders for the birds then I will do it! What is certain is that I will continue to enjoy the nature that is in my area, and hopefully learn more about the creatures that call it their home. With a lone Bumblebee feeding and the sweet song of a Blackbird on the breeze, I finish this post with one final picture. This is the view of the sky as I write. Liverpool… a City of Giants! 25th to the 27th July was the return of Royal de Luxe’s giant marionettes to Liverpool. In 2012 not long after my father had passed, Little Girl Giant, Xolo her dog and the Diver came to thrill the streets of Liverpool in A Sea Odyssey, and left a lasting impact on the psyche of all who saw them. In 2014, they once again took over the streets of Liverpool, this time with dear old Grandmother in tow. They were part of the World War One commemorations. Liverpool was celebrating the heroism of it Pals, 5,000 men who volunteered for the war effort! Almost half never returned and those who did were left with scars both physically and mentally. David and I on the Friday took the bus into town at 8am on a bright sunny morning and stood for over three hours waiting and watching as Little Girl Giant and Xolo awoke to start their journey around town and witnessed the Grandmother visit the city for the first time. While waiting for the Giants to wake up, David and I were magnets for the media. We were approached by BBC Merseyside, Juice FM and a gentleman asked if he could take our picture for a magazine, though I didn’t catch the name of it! David and I must look approachable or was it the red cat suit I wore on the day? It was hot, too hot and the swelling crowds seemed endless, like a sea of humanity stretching fathomlessly through the city’s streets. For the next three days the weather played along and visitors came from both far and wide to witness the magical spectacle. As the Giants took over the city’s streets, public transport was sorely affected. On the Friday we ended up walking half way home as buses were diverted. We finally picked up one by the Women’s Hospital, both disgruntled and with sore feet! I struggled with a migraine all weekend. The heat and standing in the sun for hours did not help. 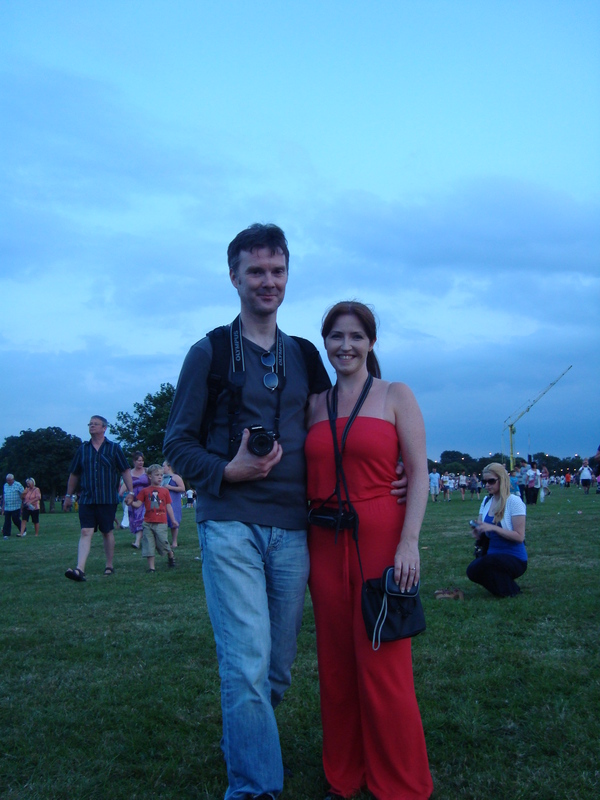 On the Friday evening, after trying to sleep off the migraine, David and I went to Newsham Park where the evenings events were to be held. We went with his family. As expected the fields were already filled with people, so we were not so lucky as in the morning in getting a front row spot! 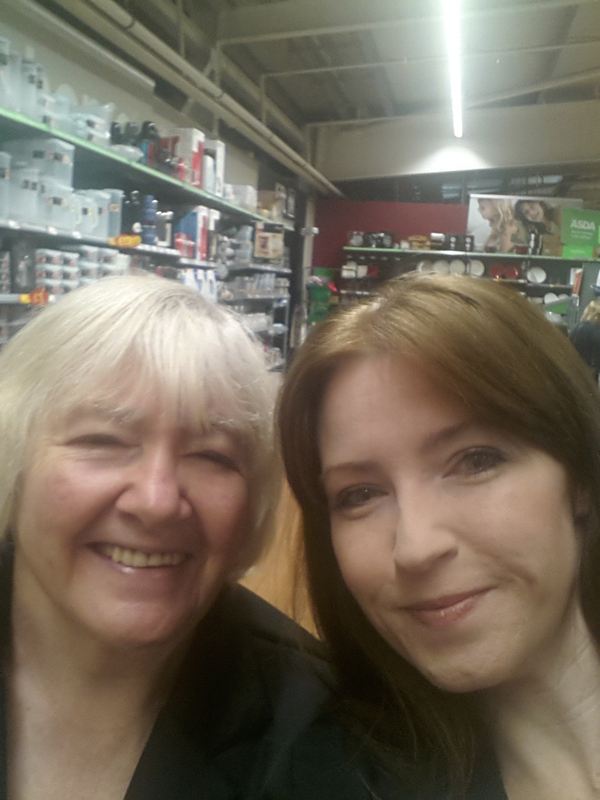 The giants were over an hour late as Grandmother had a malfunction with her head!! At least it was a nice warm evening under a golden sun! Finally the Giants entered the make shift stage. There were Pipers pipping, drummers on top of double decker cars and Xolo ran around entertaining the crowds. The grandmother sat down next to the Little Girl Giant and told the tale of how the Giants made mankind! They then all bedded down for the night while cheesily John Lennon’s ‘Imagine‘ played into the twilight. We did not go to see the other two days. Saturday was a blur as I recovered from my migraine and Sunday, because we knew there would be crowds, we decided to cut our loses. At least we had seen the Giants during their visit, and we had seen them two years ago. However I did not feel the emotion that I had on their first visit to the city. Perhaps I was still in mourning then? Either way, the Giants this time around was as good if not more productive for the city and its credibility. May they return in the future with a much stronger tale to tell.